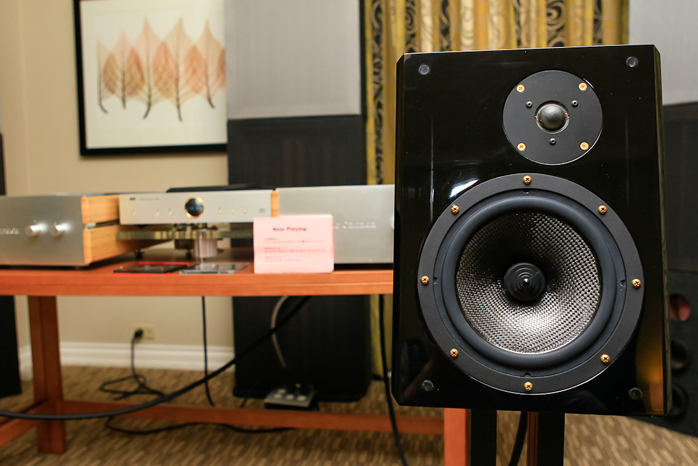 Moving on, more surprises came by way of a number of excellent yet affordable speakers starting with the $5.500 Opera Quinta (not of Consonance fame but the Italian speaker company, twin sister to Unison Research). 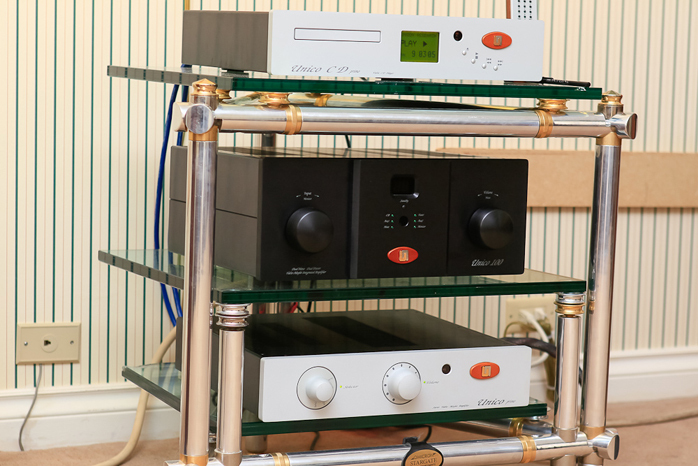 For less than $10.000 Unison and Opera offered a warm and relaxing system that may not have been the ultimate in resolution but was very coherent and inviting while not sounding reluctant or compressed. 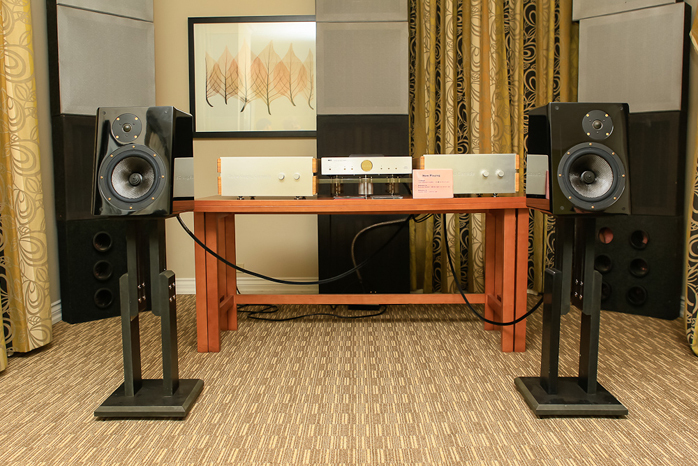 This is not the kind of system that will make you hear unknown farts in the background but the music that emanated from these elegant floorstanders simply poured over me and made me feel like staying a bit longer. 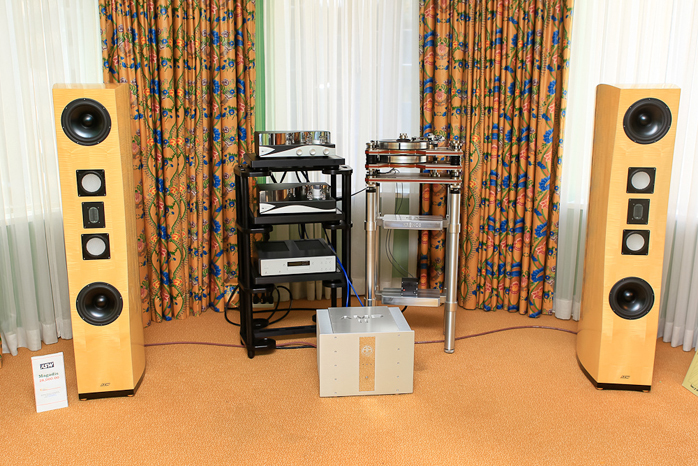 Still in the category of good rooms, Reference 3A and Tube Magic Canada made some lovely music together as they had last year. 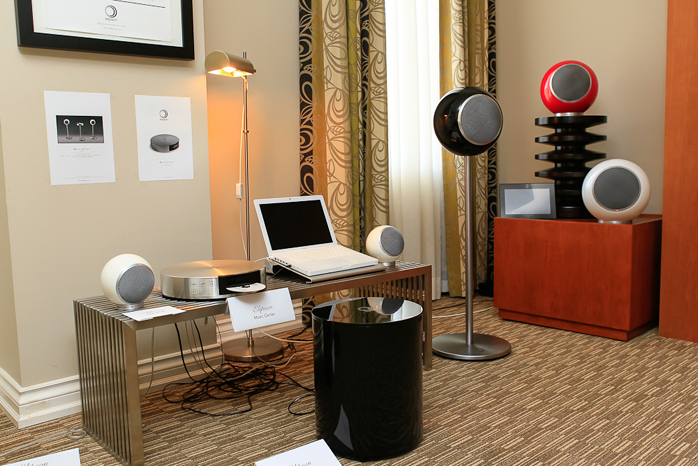 The heavy acoustic treatment brought into the room allowed for a very deep and detailed soundstage behind the speakers. 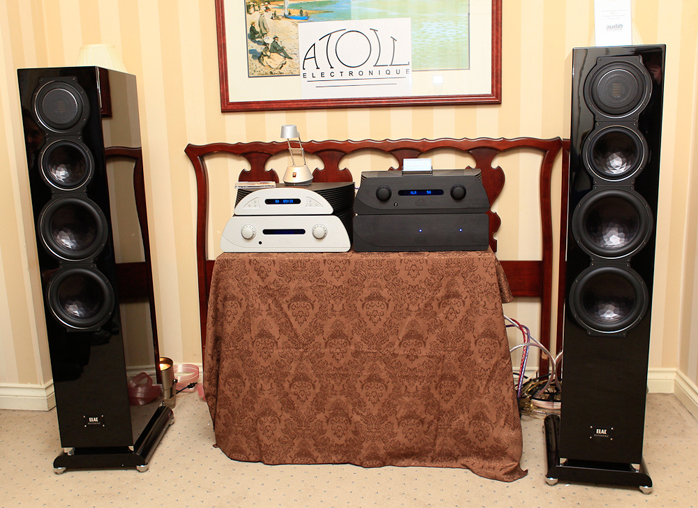 On a warmer note, Atoll and Elac packed too much gear for the room and played too loud but despite this it was obvious the association worked quite well in a warm yet dynamic way not unlike the Unison Research/Opera room but at a higher price. Warmth must have been the directive for 2012 as that's exactly how the Totem and Simaudio room sounded but taking resolution and midrange realism up a few notches over Atoll/Elac. Same gestalt but more refined execution from the Canadians with an even higher sticker. 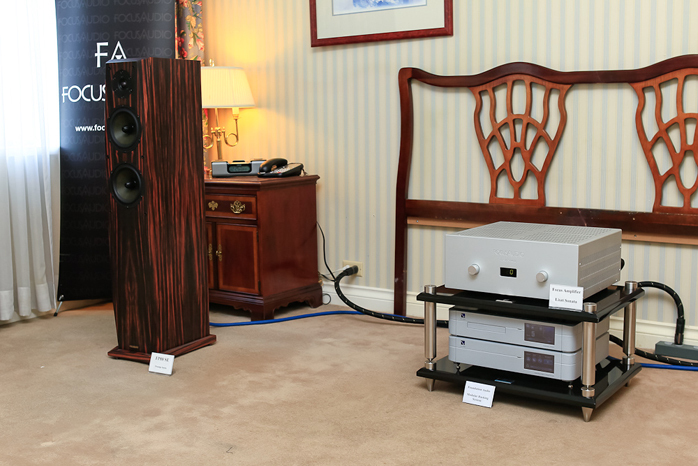 Continuing with the price ascent whilst staying below $30.000, the most impressive room was the Focus Audio FP88se ($8.000) with their own tube amplifier ($12.000) and PS Audio source. It was both extremely dynamic, transparent and tonally very true. I also loved the fact that the person running the demo was so passionate about his gear and obviously had fun being there. It’s something many manufacturers should either learn how to do or delegate to somebody capable of communicating. Here was no shortage of excitement and the resultant sound was stunning. 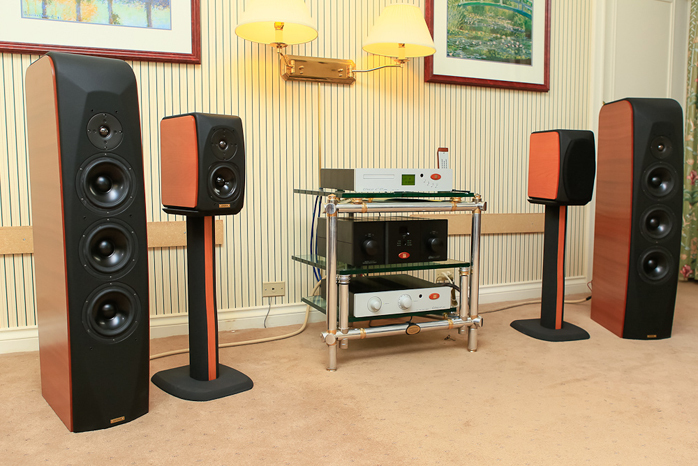 Compared to the previous three rooms, Focus Audio added dynamics and micro resolution while dropping the excess warmth. It was still a warmer sound but far less excessive. Every show has to have an ‘out of the box and slightly esoteric’ manufacturer. In Toronto for the past two years Blueberry Hill Audio fit that bill perfectly. 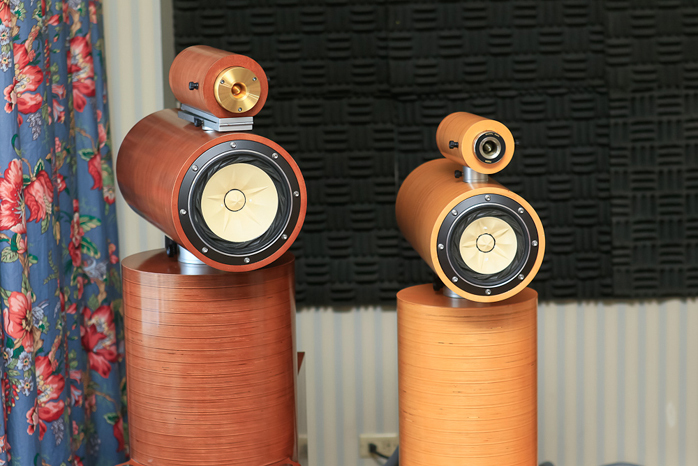 Their Nocturne 3D ($15.000/pair I believe) with their unconventional tubular enclosures, dipole Fostex midrange and upfiring twin woofers will not leave anyone indifferent visually or sonically. 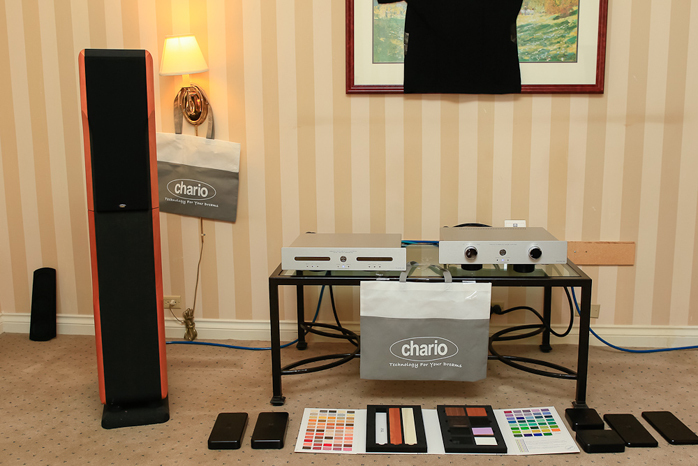 This year's models were tweaked and the bass drivers sounded much better integrated although still excessive at times. 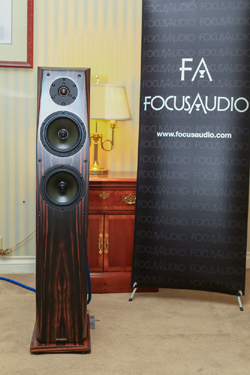 The real talent of these speakers resides in their extreme midrange resolution which is initially intoxicating. A practiced ear will also notice a touch of Fostex peakiness which, although we'll controlled, will likely lead to fatigue over time. Despite these little qualms it was hard to resist the communicative charm of the Nocturnes and the way they infused music with life and rhythm. 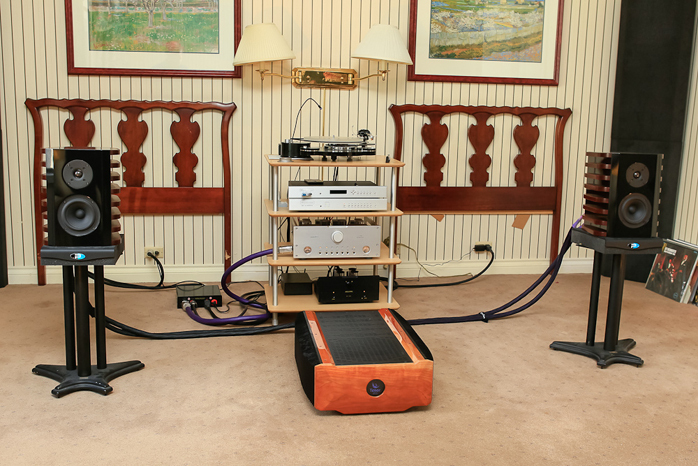 As always Joseph Audio showed a nice combination of his small Pulsar stand mount with Modwright integrated. It was as simple as it gets and worked very well. 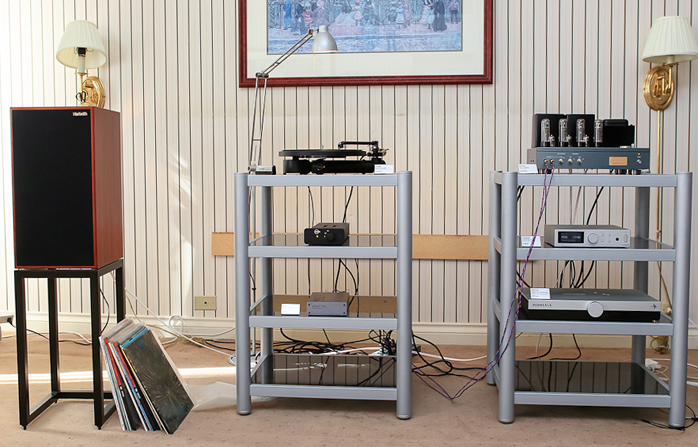 No-frills honest music reproduction that won’t fatigue or lose its shine over time. 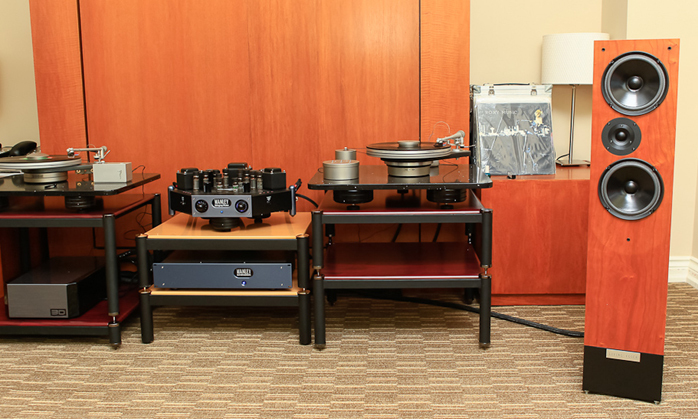 Another tried and true classic at the show was the Harbeth and Airtight association fed from a Kuzma turntable and Whest phono preamp. 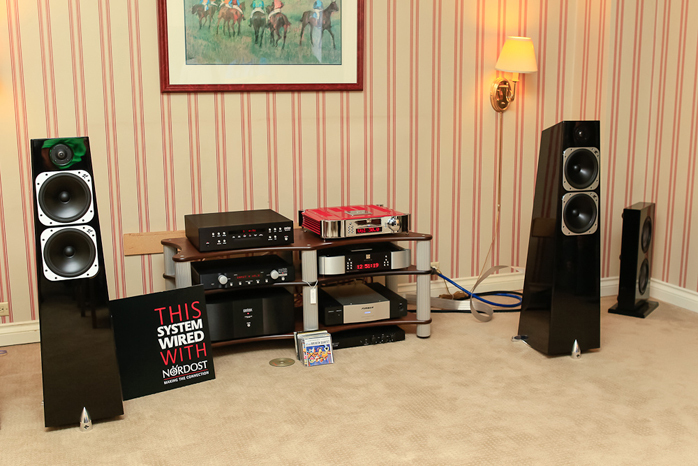 Slightly boomy bass, slightly congested dynamics but oh so rich and natural in the midrange. I moved on from this type of sound personally but I can't help being drawn right back each time. 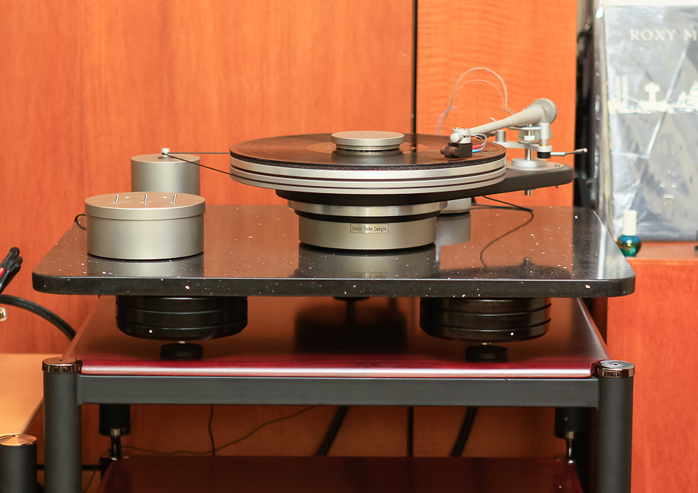 Continuing my musings along the show, the Quad 2905 with Quad electronics sounded delightful as always with transparency, depth and their trademark consistency from top to bottom. I've always loved them and despite a very noisy environment their qualities came through. I just wish they had been in one of the quiet rooms on the 8th floor. 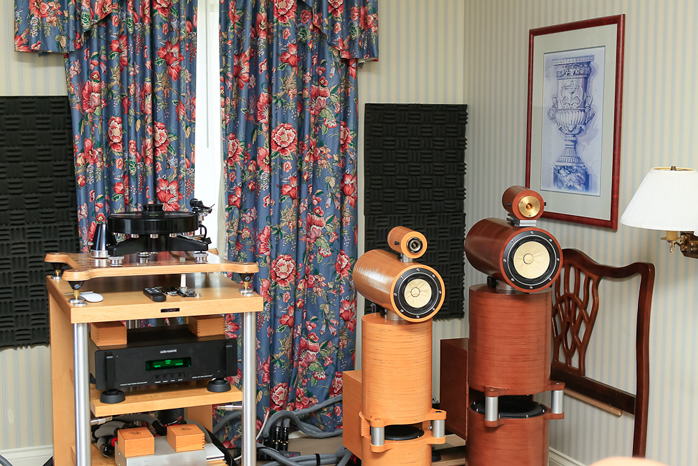 Moving right along, Samuel Furon's Atelier Audio had Ocellia, Yamamoto and Metrum on static display while playing a $2.500 Elipson complete system from France that was not out of place. 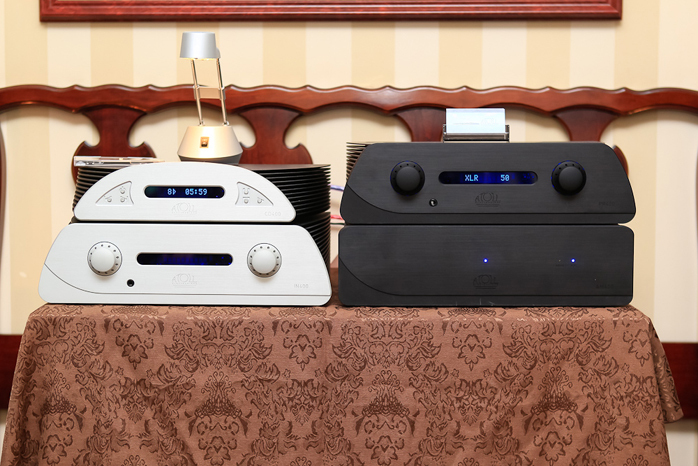 Yes it could have been a little more open and dynamic, a little more tonally truthful but I don't know of many systems at this price that offer a DAC, analog and digital tuner, amplifier, speakers and subwoofer with this level of sound quality. 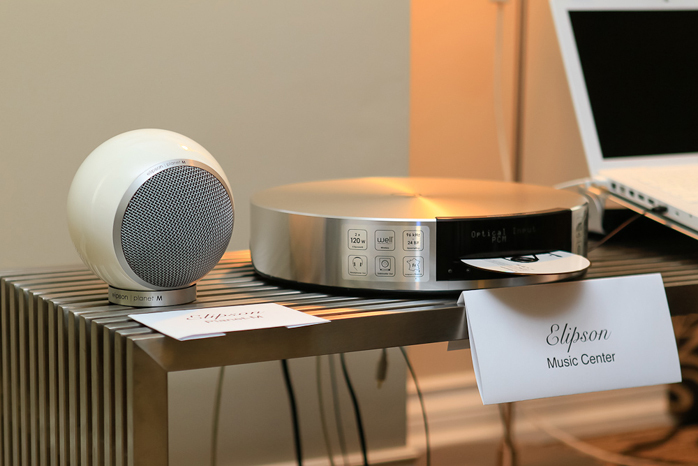 It is probably possible to assemble a great system with PSB speakers and a TEAC all-in-one for a similar budget but Elipson saves you the hassle of finding compatible elements. The result was quite surprising and quite stylish by design. 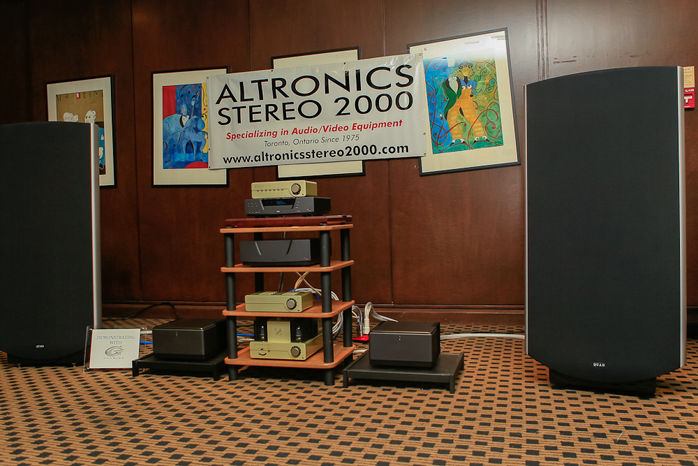 Now not every room at TAVES sounded good. 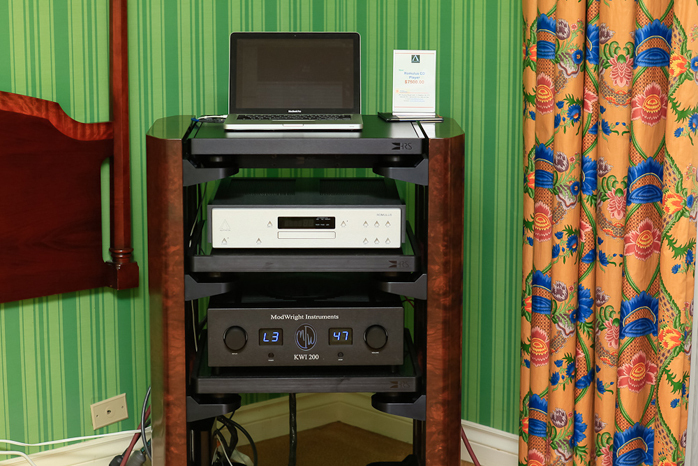 McIntosh packed a tiny room full of green and blue lights that looked like Starship Enterprise's flight deck and overwhelmed the space with thousands of watts. Simply unbearable. 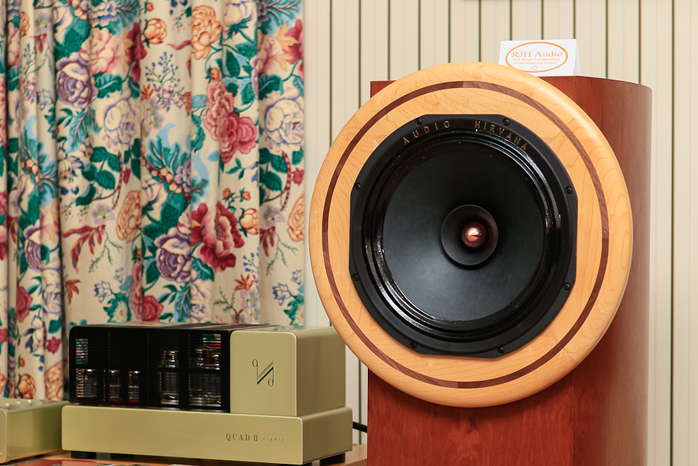 Still on the second floor, JE Audio demonstrated with Antelope and the horn-loaded Casta model C. At $28.000 a pair the sound was typical of not well-sorted horns - dynamic but peaky and way in your face. Unlike most high-efficiency horns I know, these also sounded dry and lacked lower midrange lushness. For a first encounter I did not find the result commensurate with the very substantial budget involved. On the higher floors Chario and Accustic Arts pushed warmth and fluffiness to extremes, taking all the life out of the music. Throw in honey at will and dose off. Yawn. ASW which so much impressed me last year with some of their smaller models went up in its line this year showing off their $28.000 Magadis with far less success. As much as scale and dynamism were present, tone was quite artificial to my ears. 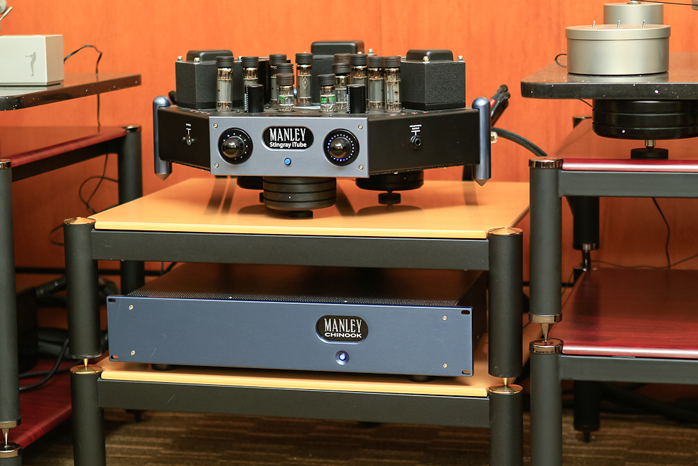 Far more unexpected I found the Living Voice/Manley/Simon Yorke demonstration strained in the midrange and hollow in the upper bass, not at all what I am used to from Living Voice. I will write this off on account of either poor synergy or poor setup. 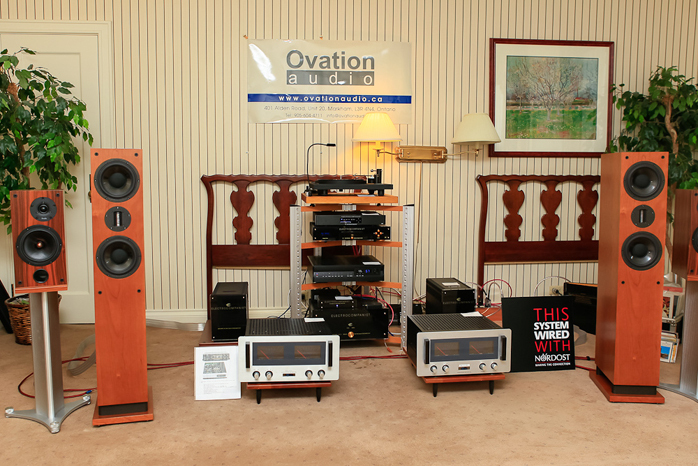 Similarly Ovation Audio was presenting ProAc speakers with a variety of very high-end electronics for a skinny and pale sound. 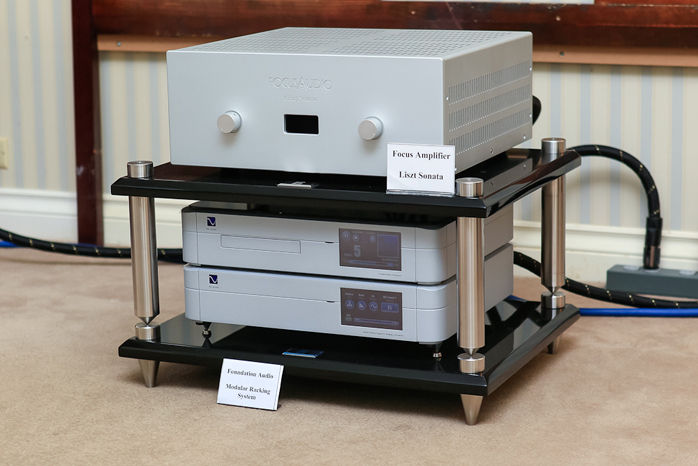 Certainly not what I am used to hearing from Electrocompaniet amplifiers. 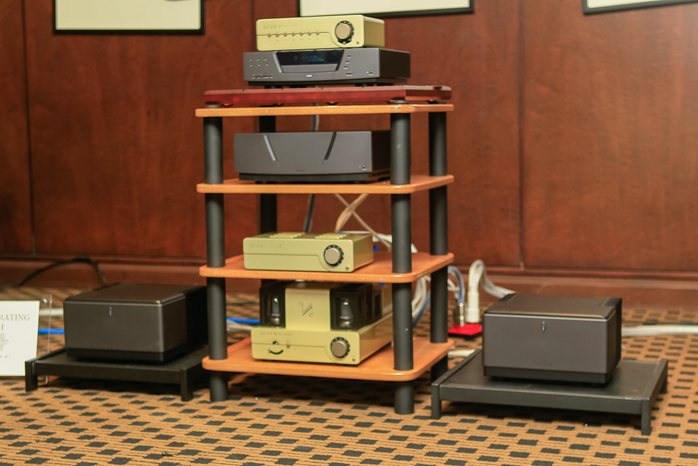 New to me was the high-sensitivity speaker company RJH audio from Ontario with their 22 to 20.000hz claim from a single Nirvana Audio driver per side. 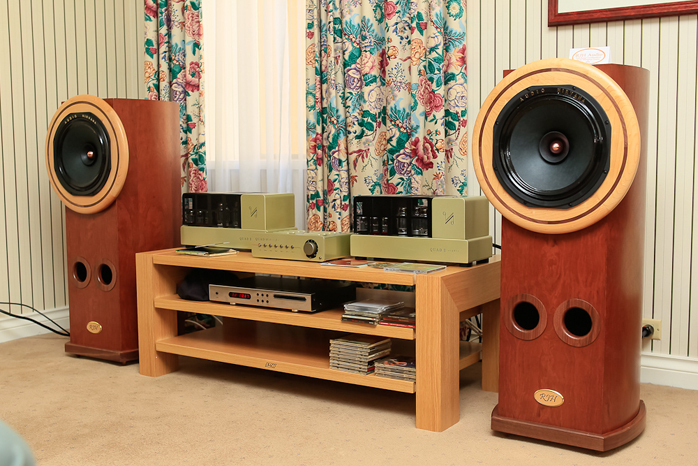 Either due to unadapted Quad electronics or simply the nature of these speakers, the sound was timid and reserved, quite a contrast with their massive enclosures. I could feel there should have been a lot of potential but the sound was so introverted that I could not get drawn in. I respect anybody trying to preserve my ear drums but this one went too far in the other direction. And finally the golden palm for pompous presumptuously bad sound went to Burmester for not just one but two atrocious performances. 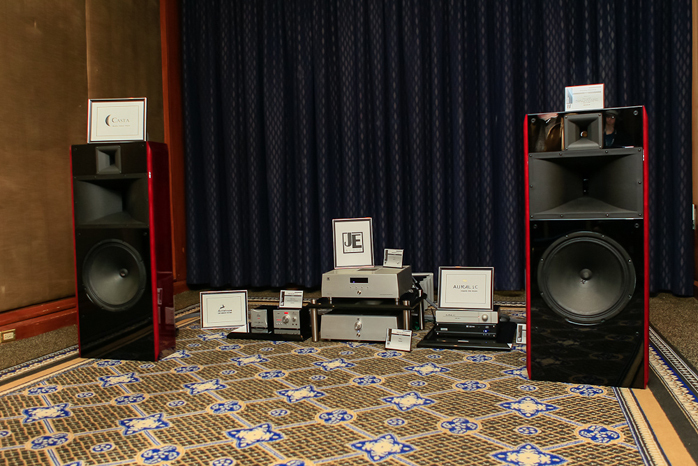 The $600.000 bling fest in the grand ball room exemplified all that is wrong in this hobby. Obnoxious, lifeless and tone deaf are the three words that came to mind when hearing and seeing the setup. Equally bad was the Porsche 911 with boat loads of Burmester electronics on board. No question I'd love to own the car but the sound system was boomy and had very vulgar tone. I have heard much better from other high-end car makers. 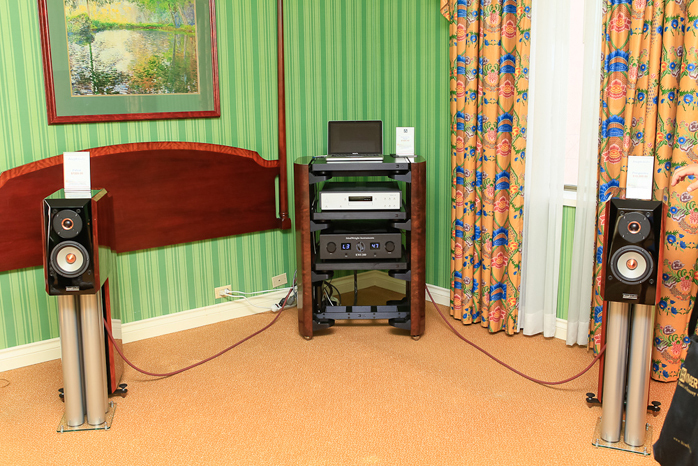 To Burmester's defense their room upstairs with Elac was both relatively cheaper and far better sounding. Everything is relative though. 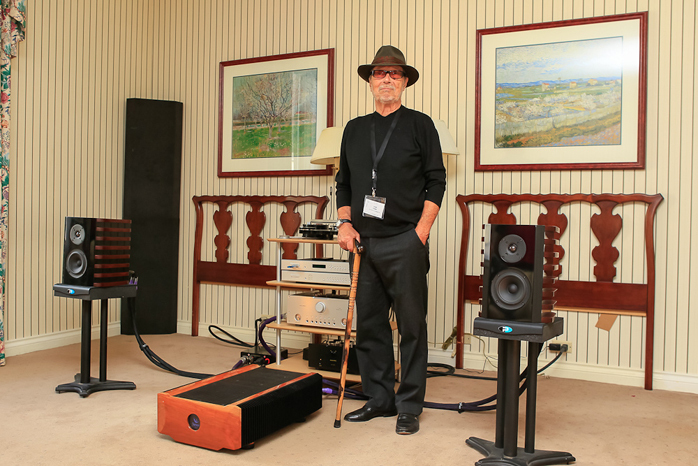 I could not conclude my coverage of the second TAVES in Toronto without mentioning Ernie Fisher and his Inner Ear magazine who insisted on posing in front of their system to send his regards to our editor [cheers Ernie, cool-cat hat! - Srajan]. Still strongly anchored in two-channel quality audio for my greatest enjoyment—and I suppose the organizers' disappointment as they probably hoped for greater crowds drawn in by the promise of giant home theaters and bombastic explosions—TAVES 2012 had turned into an even more enjoyable event than 2011 thanks in good parts to a lot of very mindful exhibitors who focused on quality over quantity. It may not be the best receipt for big crowds but it certainly made TAVES stand out!